-would like to display dif type of animal.. The Dress a Pet Event is inspired by my cat, Missy, and new kitten, Mittens. It is a very simple and straightforward event -- dress your pet as a pirate. You must dress your pet as a pirate with at least 4 accessories, 2 of which should be crafted by you from scratch!! For instance the pictured hook is crafted by foil and the pictured eye patch is a cutout paper. 2) Get creative. Feel free to use any animal. Compliant parrots, cats, dogs, reptiles, bunnies, etc are all acceptable. 3) Your pet must be dressed up as a pirate. He or she must have a minimum of four accessories. 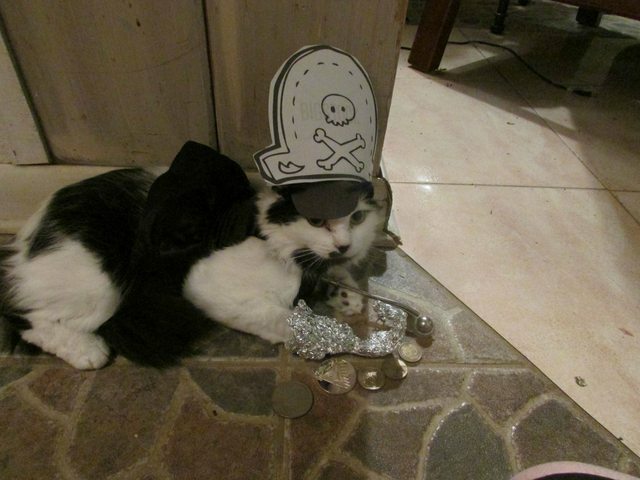 For instance, my cat pictured above has a eyepatch, hat, hook, coins, and whistle. Two of your accessories must be home-made. 4) Your entry must include a name card so I know your pet is really yours. The namecard should include your pirate name, ocean, and the year (2013). 2) You will be judged based on creativity, variety, uniqueness and photo clarity. First off, your kitty looks adorable. I have a tolerant cat, but I don't think she'd go for an eyepatch. As far as prize support goes, the wonderful way OM prize delivery works is that you provide the prizes on your home ocean, and they will deliver the prizes by means of OM super powers to any ocean (so you won't need a sloop on each ocean, just one sloop :D) if that makes sense. 4) I forgot in my fake entry below (will try to update before event), but your entry must include a name card so I know your pet is really yours. The namecard should include your pirate name, ocean, and the year (2012). @Bunny -- My cat got all stiff and glared at me the whole time haha! Wait till I try two kitties. I did not know that about ocean masters. However, I would like 3 first prizes, 1 for each ocean so it kind of makes sense to ask for 3 right? @Empress -- OOPSIE!!!! Its natural impulse to type 2012 eeks! OMs usually don't provide support to first time event runners. The exception is prize delivery, not prize multiplication. Perhaps it's the same for the OMs, but I doubt that they handle that the same way. The solution would be to provide 3 sloops/pets/trinkets each on Cerulean. The thing I love about (non-writing) art events is, that you can have pirates on Opal and Jade join the event too without much additional effort (there are several pirates who translate events if asked). I also believe, that you might not have a big competition on every ocean if you handle each ocean seperately. I have to say that I won't try to participate because my cat already was very enraged about having a helmet held over her for the Eightycats avatar. I don't want to think what happens if I try to dress her. Better for the both of us if I don't try, but a funny idea, just not for my pet! I did not know this information, especially about OMs not providing prizes to first timers! If they deny the request, I will just have to save up on each ocean in which case the contest may start later. I still would love to host this nevertheless. I see your point about not judging each ocean and I completely agree. I should just have 3 main prizes right? However, if I provide 3 sloops/pets just on Cerulean doesnt that make it a Cerulean only event? OMs may do prize delivery for first time event hosts, so you can still have an all ocean event with prizes only on cerulean. Just not a prize set for each ocean. Yeah, I think they usually agree to deliver prizes for a first timer, but don't hold us to that! As for providing your prizes, IF you get OM delivery support to deliver them, it does NOT have to be on your home ocean. I always buy my prizes on a dub ocean because it's quicker and easier for me to do there. The OMs do prefer that you have all of your prizes gathered on ONE ocean though. I usually make an alt who has nothing, to hold all my prizes, and when the event is over, I let the OM know the name of the alt, and which ocean to find it on - and then they remove everything from him/her. I also agree with Locu- I would group all oceans together - it's really not fair if one ocean has 20 entries, and another only has 2 - the ocean with fewer entrants might win something just by default and that's kinda... unbalanced... especially if the entry is not-so-great. Plus, you want to leave this open to Opal and Jade too, right? BUT that's not to say you can't award three 1st prizes. There does not have to be specific numerical orders. Top three entries win a brand new sloop! Animal-related inscribed trinkets* to be awarded to the winners and honorable mentions! Another note - some people look at the bottom line cost of items and might consider the pet to be a better prize than the sloop since it costs more. I would chose pet over sloop because it relates to the event better, but that's my opinion. I hope you go through with this. I know it looks and sounds like a lot of work, it is, but it's completely worth it, and we need more people willing to run events. I have 3 cats and they will tear my eyes out if I tried to do something like this to them. If you need a judge or a little help, give me a shout. YES, I would love you as a judge!!! 1 more to go. I think if I have someone like y'all giving me advice, I will be able to pull this off. It may not start until the May 20's though instead of the 10's which is worse for school but better for preparation and stuff. I love everyone's support, comments, and suggestions so far! Thank you so much for all of this new information! This kind of reminds me of the process of writing an essay...write, revise, revise, revise, revise, glare, revise, revise! I don't think they actually transfer it - I believe they actually magic up another on the destination ocean, but I settle for the simple answer: OMs have special powers and I, as a mere mortal, do not need to question the ways of the gods. LOL! Short answer is- you only have to collect you prizes on one ocean of your choice, if the OMs agree to deliver them for you BEFORE hand. Sounds good--- but, it's all up to you! You are da boss. This kind of reminds me of the process of writing an essay...write, revise, revise, revise, revise, glare, revise, revise! Yes it is! But it's a good type of "work" because the end result is fun! Short answer is- you only have to collect you prizes on one ocean of your choice, if the OMs agree to deliver them for you BEFORE hand. I put prizes on an alt that has nothing except his starting foil and the prizes in the inventory. If I understood that correctly that makes things much easier for the OM. As well I provide the trinket inscriptions as copy-paste-template in a PM. You have not been a first time event runner, even if that event is your first with OM support. I don't think you get renames on your first event. As ships have a different value on dub oceans than on Cerulean, that is a good way to go, especially if the event needs a forum post. So just ask people to post what prize order they prefer. If you have problems with getting the prizes just put smaller ones on the line. An event is not defined by its prizes! dressing someone's pet and making photos is fun (ok not for my cat, so not for me), no matter if you give out a coloured familiar or just a nice trinket. Or just colored sloops in "pet colours" and have the first prize renamed. You've got a lot of great feedback here :). The Pirates in the Real World was an OM run contest for RL prizes (and Cronus doll/ egg). Those are 3 I remembered that you could consider "similar". It really helps to look at those similar events to get an idea of questions people might ask too, so you can answer them in your Event post beforehand. If the cost of the prizes seems to be too much for you, you could always just have one less first prize winner (that would be one less sloop/pet to worry about). While two first prizes is very generous, it's also a liittle unconventional ;P In terms of trinkets, they don't necessarily need to be "animals" (since those might be seasonal i.e. the hermit crab). You could give out looped ribbons (2k each on sub ocean, and available year round) and just call them something clever. Like "Runners up will receive an inscribed pet collar (by which I mean a looped ribbon trinket ;P)" With a nice inscription, ribbon trinkets are just as special to me as other trinkets. I'm almost done getting them now lol so might not be too hard. I have 2 out of 3 pets, 1 out of 3 sloops and 0 out of 6 trinkets. Trinkets are a pain argh. Also, no familiars in this contest. @Everyone ---- Can I buy some stuff on dub oceans and some stuff on my sub ocean and tell the OM? I have saved up poe/dubs on there so might help me to do that. @Bunny --- Wow thank you soo much! Those contests look pretty cool. I cant believe no one has come up with this idea yet haha it makes me feel very creative! Also I just PMed Clotho thanks soo much!! It would be good to have a specific OM to help me know what is and isnt allowed especially since its the first one I'll be running. As far as the first question: I was told that to have all the prizes on one alt with no other items was the easiest way for the OMs to work it. I know Clotho will give you great advice! Just remember that you need to email your event proposal to the email address (in the events how-to sticky thread) if you're requesting OM assistance (if you haven't already done that). I haven't been kidnapped! Will get the details to Apolline as soon as possible. In the meantime, most of the comments I've seen here are right on track, thank you! For other details and questions, you can always refer to the Events How-To thread that Bunnylaroo mentioned. Great idea :) I will gladly donate an avvie to the prize pool if so wanted! Yay:) How does that sound? Those are all things I own!!! Should I take out 5th/6th place? Should I make the prizes less pets like 2 prizes instead of 3? ACK! I'm sorry - I didn't mean I'd make an avatar! I am the worst avatar artist there is! I merely suggested finding someone to provide their services to you - sorry if I wasn't clear! "....dress your pet as a pirate. Preferably home made objects and costumes, but if you have extra things laying about feel free to use them. " (rule 3) "Two of your accessories must be home-made." "Preferably" suggests you would LIKE home made but it is not mandatory and you're free to use things lying about the house, and that contradicts rule 3 where two items MUST be home made. -- dress your pet as a pirate with at least 4 accessories, 2 of which should be crafted by you, from scratch! My bad I got confused between you and darkfaery!!!! Eeeek!! Alrighty will get to editing soon!! Thank you i totally did not realize that! I think those prizes feel like bloated to reach a bigger value for all of them. An event should never been for the prizes, so if you can't provide familiars, lots of LE ships etc, just don't. Don't part from your loved ingame pets just to have more prizes. All winners receive a pet collar (ribbon) in addition to their prize. Just as suggestion, of course you are free to distribute prizes the way you want, but more isn't always better! I deleted the exact points in case you want to delete them in your post too. Inflate the numbers for each category. Art events are hard to judge and you want to give small point differences sometimes, if one is slightly better, but if 1 point already is 33% of the category you have very few choices available. 12-9-9 so you have 30 points total, but have more room in each category. Else you are very likely to end up with a draw. As well I wouldn't expose judges before the event started. PS: Don't think I don't like the event, I just want to help you with it. Great suggestions! I will either take away the point option or distribute it like you said. I did not think about the judges part! Great idea! I am soo thrilled your critiquing it, its exactly what I need! Thanks for spending the time to help me with this! Also for you and Darkfaery who are making avvies I changed it a little and added that they should be claimed by December 31, 2013. Should I extend, take out or shorten that date? Wait you have a RL horse?! ?